Organizing a party post baptism and need some caterers to make the event grand? Look no further Elkhart Catering services. We'll come and deliver at the venue of your choice. Elkhart Catering provides a comprehensive range of catering services for all occasions. Baptism is a holy occasion participated by many people. The food and other arrangements are usually different compared to marriage, anniversary and parties. We understand the importance of the occasion and our staff people can deliver as per specific requirements. Baptism is a ceremony at personal and spiritual level and we make sure the reception afterwards is equally good. Our professional staff can handle the party so that you can mingle with the guests freely. We understand that child baptism takes place once in a lifetime. There are themed menus and special packages to make a selection. Food and staffing will be taken care of so that the event goes the way you've wanted. We'll make the entire process easy for you and happy to provide our catering services. Family style meal, sit down plated services, pickup and delivery service and buffet styles are also available on demand. We'll provide complete assistance to let you decide the best as per the budget and location. The event planner in our team can provide you numerous options on baptism catering. Celebrate the special day with your child and loved ones. 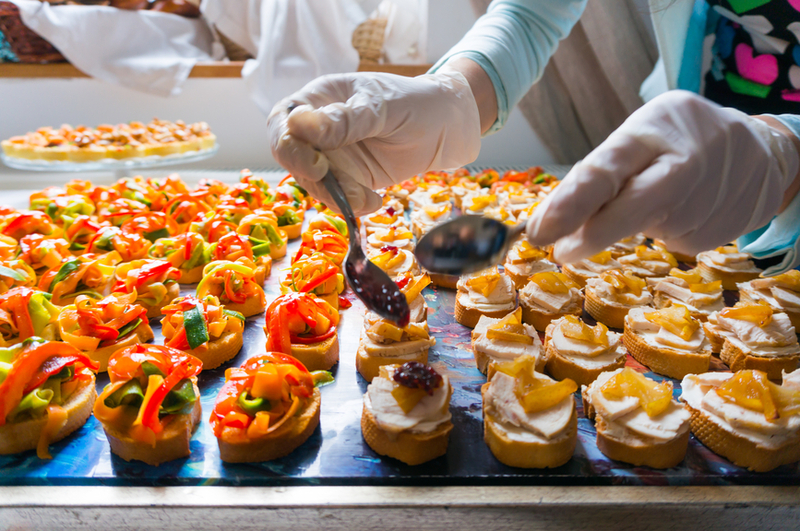 Our reliable, flexible and friendly catering services might be exactly what you're looking for. The staff personnel will be always there to address any concern and the leftovers could be collected timely as per convenience. From a small intimate gathering to more than 300 people, we can help you arrange the perfect party. Many people arrange the party at church hall or school as baptism ceremony and reception takes place at the same venue. We believe quality scores above quantity. Special emphasis is given to keep the kitchen premises clean and well maintained. Our staff maintains the highest level of hygiene to ensure the food delivered to guests is healthy. Freshly obtained food ingredients also go through multiple rounds of quality testing before reaching the chefs. We'll leave no stone unturned to create the perfect part atmosphere with our catering services. You may contact us through mail or telephone to discuss the specific requirements. Elkhart Catering has many years of experience in executing baptism parties flawlessly. The event coordinators will go through each and every aspect of baptism catering. We'll also take care of special dietary requirements to make sure the celebration is complete and fulfilling. The menu produced for guests will be suitable to the location and time. We keep on receiving compliments from clients and their positive feedback helps us improve and grow. We'll ensure the day you're spending with your special ones, relatives and friends remains unforgettable. Those who need help for their baptism party celebration may contact us. People often have a budget in mind and we are well equipped to deliver as per limited budget. Thank your guests in the best possible way for they are taking their precious time to visit.